Ben Lawrence has it all. A highly-paid job in the City, a flashy car and a wonderful flat. No shortage of ladies to keep him company, or friends to go for drinks with. On the surface, it looks as though he has an enviable life. But Ben has a secret, which he can't share with anyone, but which is threatening to take hold of any chance of happiness. Effy Jones, is down-to-earth. She has big plans for her charity, but her dead-end relationship threatens to hold her back. A chance to work with a multi-national PR company seems to be something beyond her wildest dreams. So what happens when this dream becomes a reality and Effy and Ben meet? I really liked this book from the start. OK, so I found Ben a little too cocky to be a typical hero, but he's hiding something which threatens to take over his every waking thought, and once I realised that, I think I liked him a little more. Effy, I thought was wonderful. I love the way she juggles everything in her life to follow her dreams and make her plans for the charity a reality. I also love the fact that she makes origami swans to keep her hands busy and her mind settled, whenever she is feeling stressed. 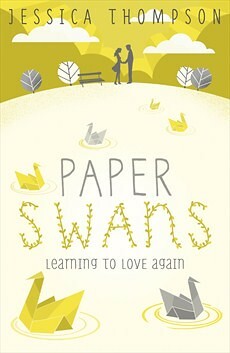 I found Paper Swans an easy book to read, and did so over the course of a few days. The story is your typical boy meets girl, boy fall for girl, something bad happens and they can't be together, but with a few little twists - one of which it took me a long time to figure out, almost until it was revealed, I must admit. Described as being a book which will appeal to fans of New Girl, 500 Days of Summer, Juno and Little Miss Sunshine, (a fact I can't really comment on as I've never seen any of those things), it's the sort of heart-warming story which would make a nice romantic comedy. Definitely worth a read! I'm reading Entry Island by Peter May which is brilliant - I love his style of writing, it makes you want to visit out of the way islands off the coast of Scotland and Canada. Thanks for visiting my blog - I managed to get the last couple of metres of the fabric in my local shop - so best not to delay! OOh, I'll have a look for it then! I shouldn't have, but I'm not sure the schedule a post tool was working quite as it should, last week.